How do we fend off the miserable weather in South Africa? We soup it up. And I don’t mean putting nitrous in our cars… we depend on Ouma’s soup recipes to keep us cosy. Everything from chunky vegetable to smooth butternut, but my favourite (by far) is a beef and bean soup. Thick and inviting, this soup is the perfect for the wind and the rain that’s keeping us inside. Sort and soak your beans the night before and leave till the following day. Once you’re ready the following day, spray a large saucepan with Spray & Cook and fry the beef in batches – just until it’s browned on all sides – then remove and put aside. Drain off any excess oil, before frying your onions, celery and carrots together until soft. Now add in your coriander, beans and prepared stock. Also add your browned beef back in. 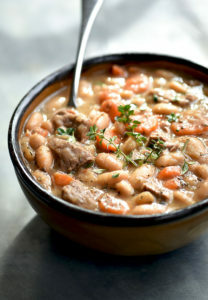 Reduce the heat and cover, allowing it to simmer for 2.5 to 3 hours – your beef and beans should be nice and tender. Feel free to add more water if it gets too thick.